I'm glad I'm not the only one who can't resist the Christmas music! It just feels ridiculous that we only sing/listen to it for one month. Looks like you had a good month of reading! I also liked Land of Love and Drowning, and I'd guess that the best book I read this month was a book coming out in January called Etta & Otto & Russell & James. On the lighter side for most of the book, which I appreciated. Sometimes you just need something fun after you have read a lot of dark, heavy books. I love that title too! I love Christmas season and all the merriment that comes with it (not talking about piles of presents) though I enjoy buying presents for my loved ones and giving it plenty of thought. I love the music--secular and non-secular- the cookie baking, the tree, the wonderful smells of everything that goes along with the holiday, the giddiness of small children I see out in public. My wedding anniversary is Christmas Eve, because my husband chose the date. That being said, if I listen to Christmas music before Thanksgiving at home or in the car my family says, "noooo, too early!" Congrats on a good reading month and the fun you had. 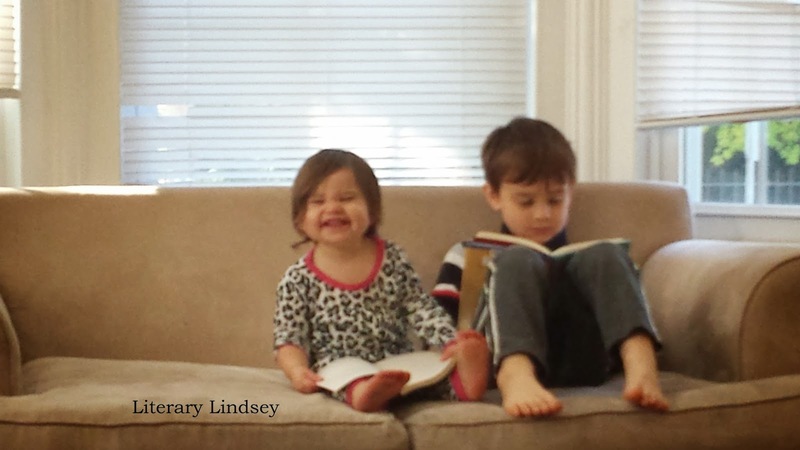 By the way, I love photos of your kids but that one has to be one of the best, since the reaction of Becca to what she is reading is...priceless!! I love all of the Christmas stuff too. I'm trying to wait until the day after Thanksgiving for the music. We all get together and decorate the tree at my parent's house. It just seems tough to wait this year! The kids were having a great time looking through David's library books. I think Becca was thrilled that she got to look at her big brother's book! Wow! You really had a diverse reading month. I've been tempted to listen to Christmas music too but decided I must pace myself. Don't want to get burned out this year. It was a pretty diverse month of books! I feel like I never have enough time to get burned out! Four weeks doesn't seem like enough time to listen to all of that wonderful music. I think Nora Webster was probably the best book that I read in October. Honourary mentions for The Miniaturist and Hitler's Furies: German Women in the Nazi Killing Fields. But that last one was really disturbing. I've heard good things about Nora Webster. I'm glad you liked it! That picture - so cute! I'm kind of getting in the spirit of Christmas already... Unlike those who celebrate Thanksgiving, it is our next immediate holiday here in the UK and so it's hard not to! Especially with temperatures decreasing and me starting some wintery reads. Night Film was my favourite read of October. I didn't get all that much reading done though seen as Night Film is a bit of a chunkster. I'm just glad to be finally clearing off my unread shelf! I hadn't ever thought about that. Duh! I feel like in the US there is this distinct feeling of having to wait for the appropriate season. I think it's push back against the store who start putting up the Christmas trees before the candy bowl is empty on Halloween! Night Film is certainly a big book, but working through that tbr shelf feels so good. I'm trying to find a balance for myself these days of review books, library books, and that giant shelf of mine! Yes, I lead our merry little praise band for the evening service so I pick out the music, run rehearsals, and then play the piano and sing.